This review first appeared in the January 24, 2008 issue of the North County Times. 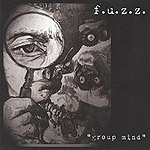 What to make of the latest release from the South Bay's F.U.Z.Z.? The easy way to describe this swirling melange of music is to avoid the issue altogether, slap the "experimental" label on it and be done with it. Trying to describe the thick, heady soup of sounds found here is a bit daunting. Lead singer Mimi has a Billie Holliday-like singing voice  high and pure and almost brittle, yet heartbreakingly expressive. Bassist Elkin and drummer Lohan create an imipressive pallette of rhythmic backgrounds, from the ultra-simple beats on "Three Way" that remind of the almost-lost art form of the African-American fife and drum bands of Mississippi, through the be-bop jazz of the opening track, "Flow," to the straight-ahead jazz of "Sweet and Lowdown" and the electronica of "State of the World." The sound is filled out by Mimi's keyboards, as well as guest musicians on sax and organ on a few tracks. But Elkin's bass playing is so melodic, it's enough with the drums and Mimi's haunting vocals to more than create a full sound on those songs performed as a trio. While most of the album has a very thick, downbeat groove somewhere between techno and house on one side and late-night classic jazz on the other, toward the end of the CD things get both more interesting and weirder. "Beat of Unconscience" is an extended 8-minute jam that would have fit in comfortably on one of Pink Floyd's early releases, while "Goatwall" is a 17-minute track with an uncredited guitar riding atop Elkin's syncopatic bass lines with a couple of heavy-duty effects boxes that give the whole a very '70s vibe. When Mimi starts singing toward the end of the track, the effect is akin to having Billie Holiday sit in with the Jeff Beck Group circa 1969. From acid jazz to hard-edged progressive rock? Give F.U.Z.Z. credit  listening to the album, it all makes perfect sense.